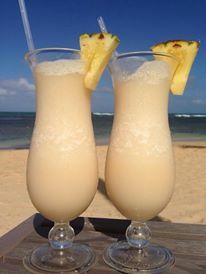 Nothing says tropical vacation like a Piña Colada! Transport yourself to the easy, breezy paradise of Breathless Punta Cana Resort & Spa with this tasty yet simple recipe for the popular creamy coconut drink. Need the real deal? Book a stay with Breathless Punta Cana today! Pour the ingredients into a blender filled with ice. Pour cocktail into a glass and garnish with the pineapple wedge and maraschino cherry. Enjoy and picture yourself lying on the beach at Breathless Punta Cana! This entry was tagged all-inclusive, Breathless Punta Cana, Breathless resorts, escape, pina colada recipe, vacation. Bookmark the permalink.